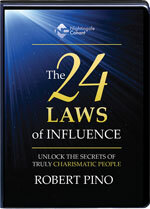 From dealing with teenagers to influencing your boss to give you a raise to negotiating a landmark deal, Robert Pino's new Nightingale-Conant program, The 24 Laws of Influence: Unlock the Secrets of Truly Charismatic People, gives you the proven instruction, motivation, and leverage you need to stay in control. King Midas is not alone. For everything Oprah Winfrey touches also turns to gold. The world is filled with influential people. But perhaps nobody is as influential across a variety of landscapes as Oprah. Oprah made the Time 100 Most Influential People list a record nine times. Her endorsement in 2008 of presidential candidate Barack Obama helped secure his victory with an additional 1,015,559 votes. Simply the act of Oprah's appearing with a product or book immediately creates stratospheric sales and creates backorder nightmares. Oprah has paved the way for underprivileged women and children worldwide to gain the education they need to excel. Now, will you experience a similar rise in fame by using The 24 Laws of Influence? Not likely — there's only one Oprah. However, it's important to note that part of the power and pull of people like Oprah, Steve Jobs, and others is a result of utilizing some of these influential 24 Laws.